You can visit our store at 119 W. Maple Avenue (Rt. 176). We are located just west of the corner of Rt. 45 and Rt. 176, in the blue house pictured here. Feel free to stop in anytime during the working hours. We'll be happy to help you! Georgi Shumanov, whose masterful craftsmanship and love of creating world-class violins, violas, celli, and bows have earned him accolades, has created a dynasty. The legend of his sought-after instruments begins in Bulgaria, where he owns a violin workshop run with the heartbeat of old world attention to detail, and a passion for tonal quality that can compete at the highest level demanded by international orchestras, recording studios, and soloists. 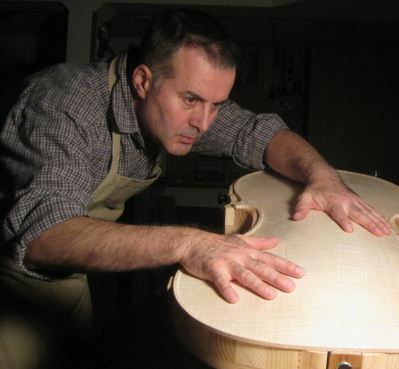 The degree to which Maestro Shumanov demands that the wood he selects from the most prized hardwood forests of Eastern Europe be seasoned and cared for is beyond the standard of most luthiers working today; his handmade instruments are thus prized and commissioned by serious musicians and investors. His rare personal will and commitment to excellence has garnered a following of string players, and has also inspired a multi-generational business. In 1989 he visited the USA and opened an agency that represented his shop in Los Angeles. His customers were prominent violin shops in the Los Angeles area to which he sold his instruments, as well as accessories made by well-known Bulgarian violinmakers. 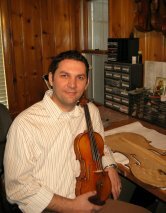 In 1994, his family members: Antoaneta, Petio, and Plamen began their studies at the Chicago School of Violin Making. With pride, in the year 1996 Georgi and his family founded Classic Violins in Chicago where his whole family is working now. In his workshop in Bulgaria, violinmakers that meet his standards of excellence make individual instruments as well as prepare high quality instruments for Classic Violins rental program. The individually made instruments in Georgi's Bulgarian violin workshop are crafted according to the specifications and requirements of the Chicago School of Violin Making. Petio Kostov is a member of the American Federation of Violin and Bow Makers, the most prestigious and exclusive organization in our trade. His artistic craftsmanship has earned him an international reputation among distinguished musicians and promising young artists. His instruments have been sought and purchased by musicians, and families of students enrolled in programs at Yale, Harvard, Duke, Tsing Hua University, Interlochen Arts Academy, and the Blue Lake Fine Arts International Youth Symphony, as well as other fine institutions. His instruments have been featured in premier recordings, such as the late Peter Blagoev’s world premier of Concerto for Violin and Orchestra #1 by Michael Karasis. In Bulgaria, he studied violin making under the tutelage of world-renowned Vladimir Naidenov. In 1994, he continued his commitment to precision and artistry at the Chicago School of Violin Making, studying closely with master violin maker Tchu Ho Lee. He graduated in 1997, after which he was an instructor there for three years. He taught instrument building, repair, and varnishing. His keen eye for detail has enabled him to elevate his craft to the highest level in our profession, using old world and creative techniques. His education includes electronic engineering, giving him an advanced knowledge of acoustics and sound production. In 1996, he became a founding member of the Classic Violins business with his father-in-law and brother-in-law. He continues to serve on the Board of Directors of the Chicago School of Violin Making. Plamen Chavdarov is an exceptional master artist whose keen sensitivity to material, superb eye, and highly tuned ear gives him the patience and skill to be a prized violin, viola, and cello maker. His international reputation has gained momentum, earning enthusiastic feedback from serious musicians and aspiring college students whose professors have played Chavdarov’s instruments. In addition to creating specially commissioned instruments, Plamen is able to discern what particular repairs and restorative measures need to be taken to help an instrument sound its best, and what adjustments can be done to maintain a valued investment. He is a founding member of the Classic Violins family business, having graduated from the Chicago School of Violin Making in 1998. His studies commenced there in 1995, after a move to the United States. During his years honing his skills as a luthier, he gained invaluable experience working in several Chicago based violin shops some of which are A440 and Austin’s Violin Shop. Plamen’s commitment to excellence is revealed in his attention to detail and passion for marvelous sound, and is further supported by the degree in mechanical engineering, which he earned in Bulgaria. 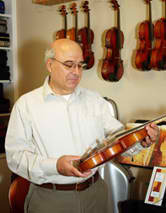 He is able to apply the same warmth and attention to each individual customer and family who come in to Classic Violins. Antoaneta, like her family members, was born and grew up in Bulgaria. She studied electronic engineering and later decided to join her husband, Petio, in the violin making profession. 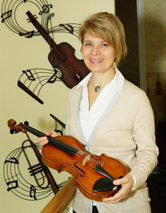 She was admitted to the Chicago School of Violin Making in 1994 where she completed 3 semesters. At Classic Violins, she specializes in bow rehair and repair and her excellent work is well-known throughout violin shops in the United States. She is the office manager and her responsibilities also include customer service, inventory maintenance, and accounts receivable. Stefanie Shumanova is the store manager. She holds an MA degree in English Philology from Sofia University "St. Kliment Ohridsky" and an MA degree in Linguistics from Northeastern Illinois University. Her experience includes working in the string/band rental department at Karnes Music, administrative assistant for Tschu Ho Lee at the Chicago School of Violin Making, full-time instructor of linguistics at Northeastern Illinois University, and ESL instructor at the College of Lake County. 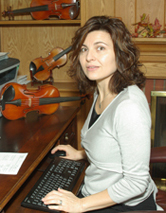 Her responsibilities at Classic Violins include advertising and marketing, new accounts recruitment, and school servicing. Dana began studying Violin with a disciple of the Suzuki Method at age 4. She went on to attend Illinois Wesleyan University, where she received her BM in Music Performance. During her senior year at the University she was Concertmaster of the Illinois Wesleyan Civic Orchestra and was awarded the Todd French/Stringworks Talent Scholarship. Since graduating in 2010, Dana has been invited to play as a substitute for several symphonies, including the Illinois Symphony Orchestra. She has also experimented with the use of violin in popular music, as the electric violinist for an Irish Rock band. Dana has taught private violin lessons since 2008 and worked as an instructor at Access Contemporary Music School in Chicago. 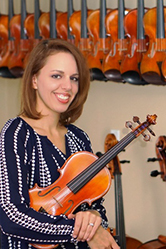 Dana’s responsibilities at Classic Violins include instrument quality control, customer service, and various activities as a school representative. She also performs for customers when they are selecting an instrument to purchase and helps them in the process of choosing the best instrument from the shop's large inventory. Hristo comes from a family of fine woodworkers. He is a fine craftsman with long experience in a variety of woodworking projects. 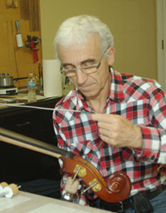 Hristo has been a member of Classic Violins repair team since 2005 contributing with his skills in the rental instrument repair and maintenance department. Spencer was born and grew up in Sheboygan, Wisconsin. At the age of 9 he began taking viola lessons. He started studying instrument repair and building in 2004 at the age of 16 with the late talented Sheboygan luthier, Mark Cooley. In 2011 Spencer graduated from the University of Wisconsin, Milwaukee with a BFA in Music History and Literature and a certificate in Celtic Studies. Spencer also plays viola, violin, mandolin, banjo bouzouki, Irish uilleann pipes and Irish whistle (which he also makes) among other folk instruments. 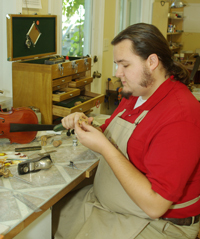 Spencer's responsibilities at Classic Violins include setting up and maintaining the rental instruments and completing customer repairs. Spencer also manages the wind & brass program and serves as the customer service representative for many schools we service in the area.